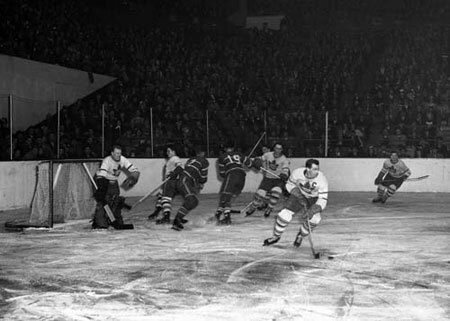 The 1947 Stanley Cup Final was a best-of-seven series between the Toronto Maple Leafs and the defending champion Montreal Canadiens. The Maple Leafs would win the series four games to two. This was the first all-Canadian finals in 12 years. The 1945 Stanley Cup Final was a best-of-seven series between the Detroit Red Wings and the Toronto Maple Leafs. The Maple Leafs won the series by 4 games to 3.